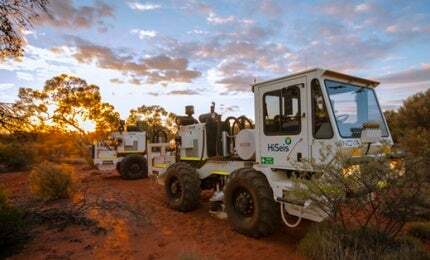 HiSeis provides end-to-end high-definition seismic services that focus on hard rock exploration; in particular, the exploration of existing mine sites and mine life planning. The company’s data reports enable investors and owners to improve their plans for the exploration and development of subsurface mineralisation. HiSeis applies a combination of novel data acquisition equipment, innovative data processing algorithms and proprietary knowledge of seismic survey design and interpretation. Using these tools, the company delivers results even in complex geological environments where conventional seismic investigations could result in an expensive loss of time and money. Pioneering work by HiSeis indicates that 3D seismic investigation has the ability to characterise the earth in 10m to 15m sized cubes and down to depths of several kilometres. With this volume, it is already possible to identify structures that control the distribution of mineralisation, create hazardous conditions for mining operations, or both, and to directly detect certain styles of mineralisation. HiSeis offers cost-effective, high-definition seismic reflection techniques, using the latest equipment, custom-designed 2D and 3D survey methods along with vertical seismic profiling (VSP) technology and full wave sonic (FWS) borehole logging. Through combined innovative technology and the know-how from experienced industry personnel, HiSeis produces reliable, quality seismic images of hard rock environments that will fast-track discovery and improve an operation’s life-of-mine planning. The HiSeis business model is based on the premise that a uniquely designed and well-executed high-resolution seismic survey will provide the best solution to certain exploration programmes, saving customers time and money. HiSeis strives to provide datasets of the highest quality and runs extensive interpretation sessions so that the customer gains the maximum value from the data. Using the latest seismic equipment selected for its high performance, low environmental impact and innovations, HiSeis can operate with significantly smaller crew sizes. Over the years, the company has built up a significant client base consisting of mineral explorers and miners that operate in remote areas. By adapting to this constraint, HiSeis is able to mobilise without incurring the high costs that are common when covering relatively small areas with high-definition seismic reflection. Such operations simply can’t accommodate the dozens of workers associated with a typical seismic crew. The combination of these technology and business innovations will deliver a more useful and meaningful seismic image of the geology to the customer, in a form that will facilitate better exploration and mining decisions. HiSeis celebrated its inaugural open day at its offices in the Innovation Centre of Western Australia on Friday 20 June. More than 90 guests were welcomed from the resources, research and other industry sectors. Borehole seismic methods: full wave sonic (FWS) and vertical seismic profiling (VSP) are integral parts of a surface seismic survey. Seismic services have the potential to provide substantial value to the minerals industry in a range of environments, but there are some applications and environments that are not suited to seismic imaging. HiSeis has recently purchased four 60,000lb (35t) Vibroseis trucks to meet increasing demands for seismic services to the minerals industry. HiSeis will be exhibiting at the Australian Copper Conference, which takes place on 17 to 18 June 2014, in Brisbane.